(CNET) -- Cisco Systems on Wednesday unveiled Cisco Umi, its consumer-focused telepresence offering that lets people connect to each other using videoconferencing on their HD television in their living rooms. Cisco Umi (pronounced YOU-me) is a telecommunications system that requires a mix of Cisco hardware and hardware you'll already need to own. The Umi service includes a Cisco-issued high-definition camera with an embedded microphone, a set-top box, and a remote, but you'll need your own HD TV (1080p) and Internet connection to use it. There is no external microphone, but you can recalibrate the audio quality. Cisco's algorithms cancel external noice and bring the voices in the foreground. Video calls and video messages are at the center of the Umi service, but the remote will also let customers manage their contact list, profiles, and settings. In addition, Umi will also record videos capable of being uploaded to Facebook and YouTube, or attached in an e-mail message. Umi's VoIP element is also strong, with the ability to place and receive video calls from friends and family from other programs equipped with VoIP video calling, specifically Google video chat. In addition, Umi has certain user controls that will allow owners to block unwanted callers, and lock the Umi system so that others can't use it in your absence. There's also a privacy shutter that clicks off the camera and goes into audio-only mode for those moments that aren't fit to be viewed. If 1080p isn't available, Umi will adapt the bandwidth to drop down to 720p or even 480p quality. As analysts predicted, the hardware alone will cost $599, with a $24.99 monthly service fee. Cisco will make Umi available on November 14 at Best Buy, with preorders beginning today. The hardware components will also be available at Magnolia Home theater. In addition, Cisco and Verizon will bring Umi to Verizon Fios fiber-optic network customers early in 2011. Meanwhile. 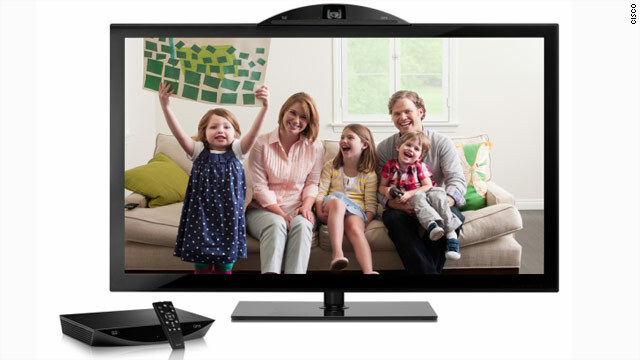 peripherals maker Logitech has its own HD video-calling product coming out today at the company's announcement of Logitech Revue with Google TV. "We believe consumers want the best and most seamless experience which means HD video calling not only from TV to TV, but also TV to PC or Mac (or vice versa)," Erik Kintz, VP and general manager of Logitech's video business, said in a statement. "We also believe consumers will want a free service and one that is integrated into a broader entertainment experience, which is why Logitech is excited to introduce an integrated HD video calling offering with Google TV." Cisco will market its Umi system with a mall tour to give prospective customers a chance to try the product hands-on. The $600 price point could be a hard sell for casual users accustomed to free VoIP services like Skype. In addition, Cisco will likely air commercials featuring Canadian actress Ellen Page, in a reprisal of her role in a series of ads to promote Cisco's telepresence for business. In reaction to Cisco's Umi, Skype invoked Moore's Law, the essence of which is that technology gets faster, smaller, and cheaper over time. "Buy a $599 device and it can be subject to obsoletism at the hands of mass-market options that sell for 1/2, then 1/4, and eventually 1/10 the price. And, when unbeatable lower cost, high performance options are readily available, spending at the top-end can be like throwing money away, especially if you are buying a video calling system and there is no one else to call," Skype's Jonathan Christensen said in a blog post.